Report of our activities covering 2011. Report of our activities covering 2012. Report covering our activities throughout 2015. More detailed information, including accounts, has been submitted to the Malta Commissioner for Voluntary Organisations in accordance with our legal obligations. Report on our activities, priorities and challenges throughout 2016. This is the narrative report delivered to the Malta Commissioner for Voluntary Organisations. Details accounts and other documents have also been submitted in accordance with our legal obligations. Report on our activities, priorities and challenges throughout 2017. This is the narrative report delivered to the Malta Commissioner for Voluntary Organisations. Details accounts and other documents have also been submitted in accordance with our legal obligations. Report of our activities covering 2013 and 2014. Published with The Critical Institute as part of our ATLAS project. International protection beneficiaries' rights explained. The rights of asylum-seekers explained. Published with The Critical Institute as part of the ATLAS project. A .zip file with 10 Fact Sheets providing basic, yet essential information on access to justice in Malta. The Fact Sheets may be downloaded here all together, or individually from our Publications page. Just prior to the Commonwealth Heads of Government Meeting (CHOGM) 2015, a side event at CHOGM on Goal 16 and the Commonwealth was organised by CHRI, aditus foundation, CIVICUS, Integra Foundation, Jesuit Refugee Service, Malta LGBTIQ Rights Movement, Platform of Human Rights Organisations in Malta. The event was supported by the Open Society Justice Initiative. Published with The Critical Institute as part of our ATLAS project, the report looks into the importance of legal assistance for the protection of fundamental rights. It is a discussion document that seeks to stimulate an exploration of ways of improving access to such assistance, especially for the most marginalised. Study into the integration of third-country national students and their families in Malta's education system, researched and drafted for the Foundation for Educational Services (FES). Submitted by: aditus foundation, African Media Association Malta, The Critical Institute, Foundation for Shelter and Support to Migrants, Gender Liberation, Integra Foundation, International Association for Refugees, JRS Malta, KOPIN, Malta Emigrants’ Commission, Maltese-Serbian Community, MGRM, Migrant Women Association in Malta, Moroccan Community in Malta, Moviment Graffitti, Organisation for Friendship in Diversity, the People for Change Foundation, the Platform of Human Rights Organisations in Malta, SKOP, SOS Malta, Spark 15, Sudanese Community, Third Country National Support Network. Comments submitted with other NGOs on Malta's draft children's policy. The second phase of the Malta Integration Network I (MIN I) Project, MIN II builds on the findings and lessons of MIN I through the drafting and development of national integration indicators. 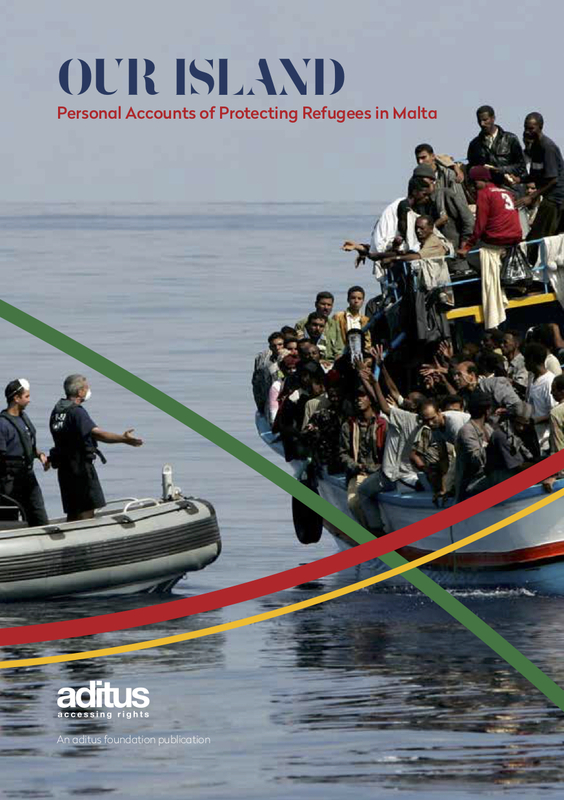 Final report of the Malta Integration Network project, presenting over 60 recommendations on migrant integration. Submitted by: aditus foundation, Foundation for Shelter and Support to Migrants, Integra Foundation, International Association for Refugees, Jesuit Refugee Service (Malta), Kopin, Migrant Women Association Malta, Organisation for Friendship in Diversity, People for Change Foundation, SOS Malta. Comments submitted with other NGOs to the Civil Liberties Ministry on the future of human rights in Malta. Technical submissions on migrant integration submitted to the Ministry for Social Dialogue, Consumer Affairs and Civil Liberties by aditus foundation, Integra Foundation, JRS Malta, KOPIN and the Organisation for Friendship in Diversity. Research into Malta's age assessment and guardianship procedures for unaccompanied asylum-seekers, produced in the broader project funded by the VOICES Foundation. The under-signed 14 non-governmental organisations working with and for migrants, asylum-seekers and refugees would like to take this opportunity to offer suggestions as to how Malta can express and practice such solidarity. At the heart of our recommendations is the belief that solidarity should not be exclusively based on mechanisms beneficial to Member States, but that it ought to be primarily concerned with upholding the fundamental human rights of those persons facing intense hardships and violations. Our position on the banning of 'conversation therapies'. Malta's first and only publication that gathers most judicial pronouncements in the area of asylum, thematically presented to cover: administrative detention, age assessment, asylum determination, access to territory and non-refoulement, and rights of international protection beneficiaries. With the support of the Small Initiatives Support Scheme managed by the Malta Council for the Voluntary Sector. A joint publication of aditus foundation, Integra Foundation and JRS Malta as part of Project Integrated. Dari? presents data from around 80 visits conducted to refugee homes in 2015 and 2016. Project Integrated was supported by UNHCR and the Malta Community Chest Fund. Study on refugee integration in Malta, produced in the two projects: Meet the Other and Stakeholder Information Sessions. Protecting Stateless Persons from Arbitrary Detention ENS and aditus foundation report on detention and stateless persons. A new report published today by the European Network on Statelessness and aditus foundation on the use of detention of stateless persons in Malta, reveals that the widespread use of administrative detention has a severe impact on stateless persons. The absence of procedures to identify and recognize statelessness results in detention that in many cases is not in conformity with Malta’s human rights obligations. Furthermore, stateless persons are unable to receive any form of legal and social protection since their status remains largely unidentified. The report is nonetheless optimistic that up-coming changes to Malta’s detention regime, as also possible steps towards the 1954 Stateless Convention, could result in dramatic changes to the way stateless persons are treated. A report assessing Malta's education policy on trans, gender variant and intersex students. The document includes a Policy Assessment Tool, a methodology based on human rights indicators in order to evaluate the relevance, effectiveness and efficient of human rights measures. Published by JRS Malta and aditus foundation as part of 'Project Integrated'. An information leaflet drawn up in the frame of the project 'Time for needs: Listening, Healing, Protecting. A joint action for an Appropriate Assessment of Special needs of Victims of Torture and Violence', co-funded by the European Union. A report draw up in the frame of the project 'Time for needs: Listening, Healing, Protecting. A joint action for an Appropriate Assessment of Special needs of Victims of Torture and Violence', co-funded by the European Union. Comments submitted to EASO on its 2012 Annual Activity Report of 2012. Comments submitted to EASO on its Annual Report of 2012. Submissions presented with other NGOs to the UN's Universal Periodic Review for Malta's second review (2013), highlighting various human rights concerns in Malta. Submissions presented with other NGOs to the UN Committee on the Rights of the Child for Malta's Review Session in 2013. Comments submitted with other NGOs towards a general day of discussion held by the UN Committee on the Rights of the Child, on children in international migration. Submitted by the Coalition of NGOs on Statelessness in Malta: aditus foundation, the Institute on Statelessness and Inclusion and the European Network on Statelessness. Technical comments on proposed legislation transposing the Recast EU Qualification Directive. Technical comments on proposed legislation to reform Malta's provision of out-of-home care, also affecting unaccompanied refugee and asylum-seeking children. Our input on a Bill proposing to criminalise conversion therapies. The aim of this document is to present our comments and feedback to the Minister for European Affairs and Equality, and to the Parliament of Malta, in order to strengthen the Bill’s potential to broaden and strengthen marriage for all persons. Input by us and MGRM on the review of Malta's IVF legal regime. Comments on proposed legislation to improve the rights of transgender and intersex persons. Input to the Ministry for Social Dialogue, Consumer Affairs and Civil Liberties (MSDC) on the Equality Bill. Our comments on legal proposals to transpose the EU Victims' Rights Directive. Submissions made by aditus foundation and JRS Malta. Intercultural competence training handbook, produced in the project 'Intercultural Competence Programme'. Training manual on refugee integration, used in deliver of training in the Stakeholder Information Sessions project. Updated training manual on refugee integration, used to deliver training in the Stakeholder Information Sessions project. 9 postcards on the lives on 9 women in Malta, produced for International Womens' Day. Information leaflet on international migration.